I am a long-time skeptic of birding-specific clothing. Too often I see birders out in the neighborhood parks looking like they're embarking on an African safari: zip-away khaki pants, million-pocketed vest, bucket hat, and other needless accessories. Play it cool, you know? But, I keep an open mind, and when the Wunderbird company asked if they could send me a sweatshirt to try out, I readily agreed. Birder clothing that doesn't look like "birder" clothing? Happy to investigate. They sent me a large blue Gyrfalcon hoodie. First things first, this sweatshirt looks great. It looks cool, which is not something I'd ever thought I'd say about birding clothes. It fits really well -- sleek and not too baggy, which can be a real downer in a sweatshirt. The fabric is smooth and there's a ton of reinforced stitching; it's a high quality item, no doubt. Here I am wearing it in the DC heat, pointing out some great birds to Hisao. It's pretty handy! The binoculars sit in there snugly and come right out when there's something flapping by that I need to examine. I really like this feature. I have heard from some women, however, that this chest pocket isn't a great solution for them. I don't know whether the women's cut version of this sweatshirt might somehow make this pocket work better, though. 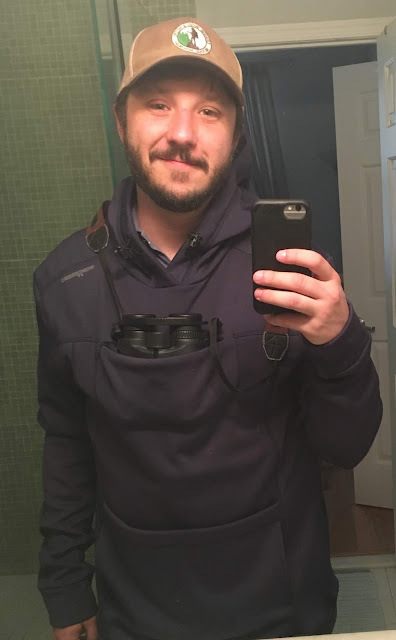 The other "birder" features include a large front pocket complex that includes side-entry hand warming pocket and a large velcro front pocket for storing a field guide or snacks or whatever. There's a smaller mesh pocket inside this large front pocket. I really like the side-entry pocket, it's snug and comfortable -- again, this is a really well made sweatshirt. The large front pocket was nice, too, though I don't imagine I'll use it to store very much, and the single strip of velcro could use some reinforcement. Wunderbird's Gyrfalcon sweatshirt represents a new world of clothes for birding. I wouldn't be caught dead in a khaki vest or bucket hat, but I'll wear this whenever the weather allows. See you out there!